Why would you want to put drawers or boxes in your server rack? Like most IT Staff there is a ton of stuff that usually gets left sitting on top of the equipment. Software, manuals, test equipment, the list is endless. What rack drawers and boxes allow you to do is secure all this stuff where it is used the most, next to the equipment. Rack drawers and boxes are available in several sizes and configurations. The drawers and boxes are 14 1/4″ in depth. This allows them to be mounted back to back in a 29″ deep rack. This maximizes the usable space and provides the versatility to choose what option works best for a given installation. 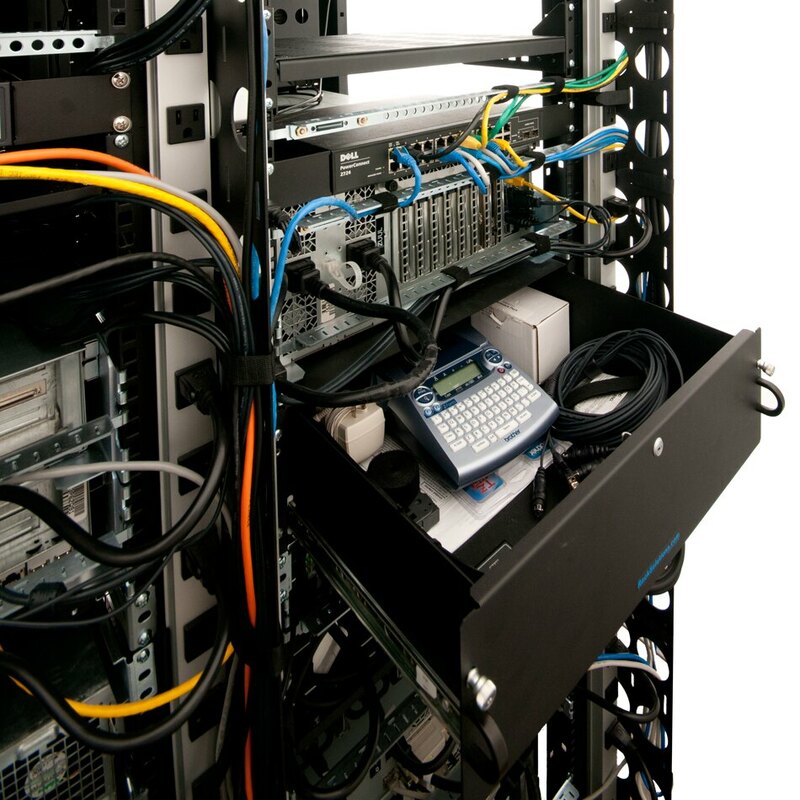 The drawers and the boxes with lids are lockable to secure expensive equipment such as laptops or test equipment in the rack. Rack drawers and boxes will make a difference to reduce the clutter and increase the organization in your rack. The photo shows the internal racks here at RackSolutions and you can see that we “Eat our own dog food” utilizing drawers on the front and rear of our racks. This entry was posted on Wednesday, May 19th, 2010 at 10:03 am	and is filed under 2 Post Racks, 4 Post Racks, Hardware, Racks. You can follow any responses to this entry through the RSS 2.0 feed. You can leave a response, or trackback from your own site.